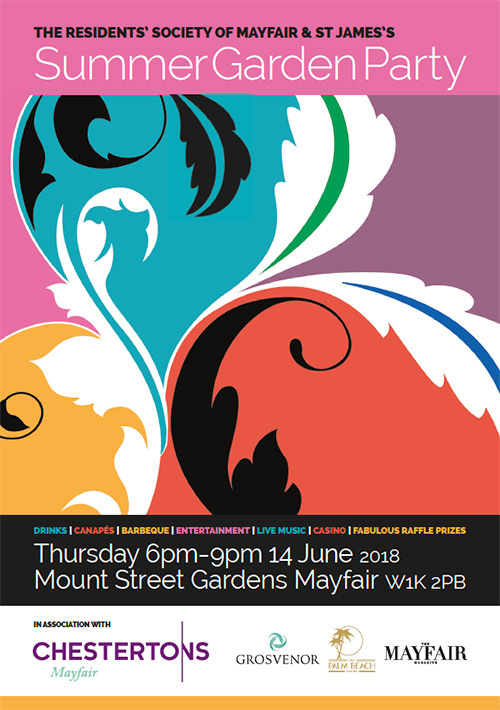 A WONDERFUL EVENING for residents, businesses and their guests at a private party to celebrate summer in Mayfair in support of the Residents’ Society of Mayfair & St James’s. Opening at 6pm and closing at dusk (around 9pm), our 2018 summer garden party is its usual heady mix of drinks and food as well as live music, entertainments and friendship. table but the prizes will be real. fantastic chanteuse to help you dance the night away. delicacies from Annabel’s night club. from our Shaken’n’Stirred bar and non-alcoholic drinks too. showing their skills and products for guests to either admire or buy. You may also buy your tickets using cheque or cash at the Mayfair Library, 25 South Audley Street, W1K 2PB. 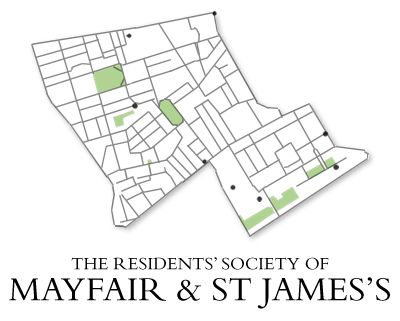 made out to the Residents’ Society of Mayfair & St James’s and post to RSMSJ, 4 Connaught House, Mount Row, Mayfair W1K 3RA.